To be in the presence of an experienced and learned Tibetan Buddhist Geshe is scarce indeed. 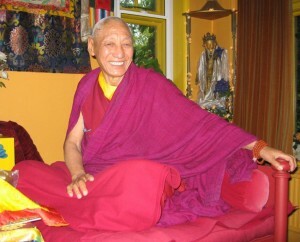 Venerable Geshe Damcho Yonten is from a rapidly disappearing era in the Tibetan Buddhist Tradition. He entered the great monastic university of Drepung near Lhasa, the capital of Tibet at the age of six and for the next 23 years, he pursued intensively the formal studies in Buddhist philosophy, psychology, logic, debate and scriptural subjects, and the practice of meditation under the direction and guidance of some of the most learned and experienced Lamas in Tibet. After escaping from the Chinese invasion of Tibet in 1959, he was able to complete his studies in India and Ladakh, attaining the high qualification of Lharampa Geshe. During the six years he spent in Ladakh he became Abbot of Samtenling Gompa Norba. Returning to India in 1966, Ven. Geshe Damcho gathered his first western students, and it was at their request that in 1976 he compassionately came to the West to teach Buddhism for the benefit of all beings. In July 1978, students helped establish the Lam Rim Buddhist Centre in Wales and in 1989 the Lam Rim Bristol Buddhist Centre was established in Bristol. Also in 1989, Ven. Geshe Damcho was first invited to give Teachings in South Africa and he has returned on a number of occasions at the request of his students, and is the Spiritual Director of Lam Rim Buddhist Centre in Johannesburg, founded in 1993. In that same year the Lam Rim Buddhist Trust of South Africa was founded and a property was secured which over the years has been converted into a traditional Tibetan Buddhist Temple. We were most fortunate to have His Holiness the 14th Dalai Lama visit and bless The Centre on the 4th of November 2004 and have had teachings from His Eminence the 102nd Gaden Tripa Kyabje Rizong Sras Rinpoche in 2007 who is at present the head of the Gelug Lineage.